Part 1: Is there *really* a housing shortage? With a housing white paper due out soon, another battle is brewing between those who think we have a housing shortage that’s driving up prices and wealth inequality, and those who worry, baselessly, that the country is about to be concreted over. Amid the sturm und drang, what nobody appears to question is whether there actually is a housing shortage. A recent FT leader neatly summed up the conventional wisdom on housing in the UK. We don’t have enough housing. The UK has an ‘endemic shortage of housing’ as housebuilding has ‘lagged behind population growth’. Housing costs are high as a result. These have ‘wiped out income gains made by the bottom half of households’ over the past 13 years. Building more will solve the problem, especially for the less well-off. ‘The fundamental problem is one of supply’ it argues, and boosting it will substantially benefit those people who are ‘just about managing’. This is a dominant view. In fact it appears to be the almost unanimous view, of commentators at least. I can’t recall reading a newspaper article on housing recently that didn’t refer to ‘solving the UK’s housing shortage’. It is the premise on which all subsequent debate about housing is based. But what if it isn’t true? My reading of the evidence suggests it isn’t. The best data we have shows that: the UK does have enough housing; housing costs are not high by the standards of the last 25 years, and have in fact fallen over the past decade; and additional supply, while welcome, will not have much impact on house prices or housing costs. Before getting into the evidence, I should point out that there ‘being enough housing’ does not mean we don’t have some serious housing policy challenges. These tend to be distributional: in particular homelessness, a shortage of social housing, and much tighter restrictions on Housing Benefit for people who struggle to afford market rents. But distributional problems are separate from the macro question about overall housing supply I’m going to focus on here. Because this stuff is chewy, I’ve split it over three posts. In this one I deal with the question of whether there is evidence of a shortage of houses for people to live in— or at least a shortage that has worsened over recent decades. Is there a shortage of supply? No. Back in 1991 there were just over 3.0% more houses than there were households in the UK according to government data. Today, using the ONS’s latest household estimates, there appear to be 5.2% more places to live than there are households that want to live in them. 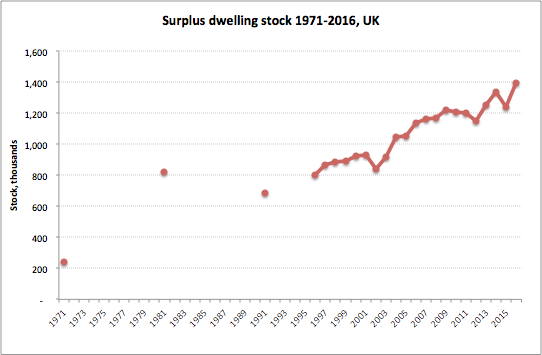 In fact growth in the stock of dwellings appears to have outstripped that of households over the past 50 years or so. This is a strange sort of ‘endemic shortage’. So where has the perception that we have a shortage come from? Two sources seem to be to blame. One is repeatedly exaggerated official estimates of growth in the number of households in the UK. 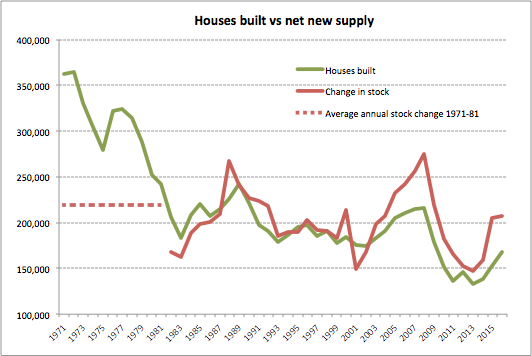 The other is a tendency to focus on house building rather than the net change in stock, which is what really counts. First take forecasts of the number of households. Work by the respected Alan Holmans in a paper from 2013 suggested 240k new dwellings might be needed in England alone, to keep up with projected household formation to 2022. Similarly, a recent House of Commons Library briefing highlighted the need for 220k new homes per year in England. The FT leader, mentioned above, claims the need to build 300k across the UK to ‘gradually redress the balance’, which is roughly consistent with the above numbers for England. 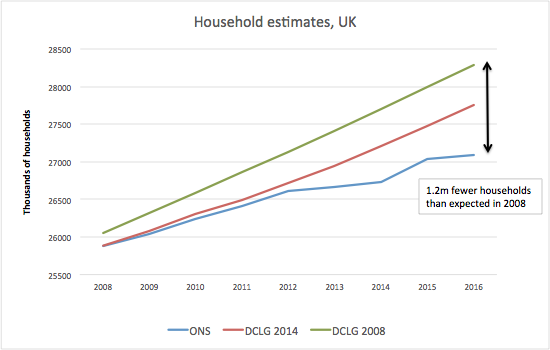 These figures all appear to be based on various vintages of the DCLG’s forecasts for the number of households, the latest of which suggests annual UK household growth of about 260k from now to 2022. But these forecasts have persistently overshot by a long way for many years. The chart below shows DCLG’s forecast of the number of households in the UK based on 2008 data (green line), then based on 2014 data (red line), and then the ONS’s survey-based measurement of the number of households there actually are in the country. Back in 2008 DCLG forecast that about 280k households per year would form in the UK in the eight years to 2016. Even the 2014-based projection suggested 235k per year over that period. In light of those expectations it’s easy to see why you might worry about undersupply when the housing stock is growing at under 200k per year. But the reality — or, at least, the best evidence we have — is that the number of UK households has been growing at only 152k per year since 2008. Consequently we now appear to have a whopping 1.2 million fewer households in the country than was anticipated in 2008 (see chart). Even if we want to err on the side of caution, it’s hard to see how the UK needs more than 200k per year to keep pace with household growth at present. Nor is the recent 152k rate of growth particularly low by the standards of the past. 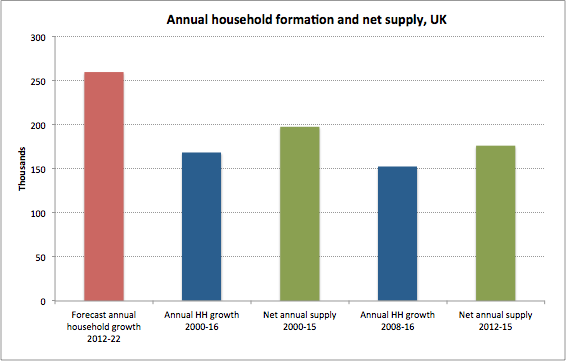 Since 2000 household formation has averaged 168k per year in the UK. In this context DCLG’s forecast of around 260k new households per year between now and 2022 — or anything close — looks pretty unlikely to say the least. Why does this overestimate keep happening? The main cause appears to be that DCLG have expected average household size to resume the descent it made from 1961 to 2001 from an average of 3.01 to 2.36 people per household. In practice average size flatlined through the first decade of this century and on ONS data appears to have been rising, if anything, since 2013. Consequently the demand for places to live isn’t rising anything like expected just a few years ago. Forecasting this kind of thing is obviously very difficult. But all the more reason we should be looking at the data as it becomes available rather than relying on the forecasts. So the need for new dwellings seems to be growing much more slowly than expected. But is new supply even keeping up with that? Yes, and then some. Very often in commentary on the housing situation house building figures are compared to the above household growth numbers. But that can be a poor guide to how the number of dwellings in the country is changing. Conversions, changes of use and demolitions all contribute to the net additions to the housing stock each year. And since the start of this century net additions have been a fair bit higher than the rate of new building (see chart). Incidentally, observers often lament our inability to build at the 350k+ rate of the early 1970s, but much of that was replacing inadequate or bomb-damaged housing. Indeed the stock only rose at 219k per year over that decade (1971–81, see dashed line on chart). Focusing on new build numbers misleadingly suggests a huge slow-down in the rate of supply growth over the decades — and that impression stokes the perception that there is a problem. In practice growth in the stock of houses has been running at around 176k per year since 2008 (some 24k per year more than household growth), and 197k per year since the start of the century (29k above annual household growth — see chart). That’s up to 2015, and recent house building figures imply that 2016 will push those averages up. Putting all that together it’s pretty clear that the main cause of the alarm is DCLG’s household formation forecast for 2012–22. But looking at the data doesn’t give us any reason to think that we have a problem of insufficient supply. Even though there’s no apparent shortage in the number of houses available, it could still be the case that there is pressure on the cost of housing that might be helped by building more. The next blog, which I’ll put up later, will explore the evidence on whether costs have been rising.